The National Indoor Arena (NIA) has become an established part of Birmingham life in the past two decades – but its £20.6 million revamp aims to bring the city inside. The huge investment intends to keep the arena at the forefront of the events business amid growing competition from Europe and beyond, although the inspiration for the redesign lies closer to home. Part of the refurbishment, which will add almost 65,000 sq ft of floorspace, will reflect Birmingham&apos;s heritage, with nods to the Jewellery Quarter and its history as The City of 1,000 Trades. It will also add new eateries to bring people in at all times of the day, with more than 16,000 sq ft of space created for food and drink operators overlooking the canal. NIA managing director Phil Mead said that while the venue remains a success, it has never made the most of its city centre location. "You don&apos;t get too many arenas in the city centre with views over a canal," he said. "You don&apos;t get many with glazed frontages. It will look very dramatic and give a real sense of arrival. At the moment you arrive by the car park." He added: "We are making a big change to the customer and client experience including bigger rooms backstage for the artists. "For many of them their whole experience of Birmingham is backstage at the NIA, so we want to make it a good one." A key part of the plan for the new NIA is to better reflect the city, particularly its heritage. The first mezzanine floor will be designed to reflect the Jewellery Quarter, with diamonds and golden chains dotted around. The second mezzanine focuses on industrial heritage, with hints of copper and mesh. The most significant change will be the extension of concourses and new areas to improve the customer experience. These concourses will expand from 20ft to 72ft wide while a new Barclaycard lounge and improved corporate areas will offer luxurious spots for a drink while waiting. The new canal-side area will be split into four or five food and drink establishments and Mr Mead said there had been no shortage of interest. He said: "We are looking at brands that are complementary to both the arena and Brindleyplace. So far, we are quite advanced in selling the units. "And selling that space is bringing in new revenue, as is the sponsorship itself." The arena will re-open in September with work completed by the end of December although Mr Mead refused to give anything away about the artists in the running for the opening night. The business plan is to bring more people in and continue to attract world-class events which he said would be under threat without improvements. The likes of Drake, The Vamps, Riverdance and Lee Evans were among those to perform at the arena this year, but Mr Mead said demand for artists&apos; time has never been so high. He said: "We are still very busy today. Before we started the development we were in use for a good 200 days a year, which is a pretty strong programme. "But there were a few reasons we needed to redevelop. The arena was getting a bit tired, although well-maintained, but the big thing for us as operators, as well as the city, is our market share. The market is incredibly competitive. Over the last 15 years every city in the UK has built an arena or tried to. "In entertainment, artists like Lady Gaga can only play so many dates, so you need to stay in the Premier League to keep them coming here. "It is slightly different for things like Disney On Ice, where they can have a different show for Europe and the US. "For international sports events, we are bidding against other cities all the time. "For the World Indoor Athletics it was a city in America, and for other events we are always up against European cities. It gets difficult to do that when your venue is getting tired. "It is already working in that we have won the bidding for a few big events," he added. "The first tender was the Yonex All England Open Badminton Championships. The tender was up and Manchester, London and Sheffield were after it. "That event is like the Wimbledon of badminton. It is beamed all over the world into something like 130 million households," said Mr Mead. "The work we are doing was a big part of winning it again and we have secured it until 2021. "The same applies to the World Indoor Athletics. Without the redevelopment we have been able to show it would have been a harder sell." Cliff Richard has been the most prolific performer at the NIA, with a total of 67 nights, while events like Gladiators and the Eurovision Song Contest and world championships in BMX, indoor athletics and gymnastics have put it on the map. 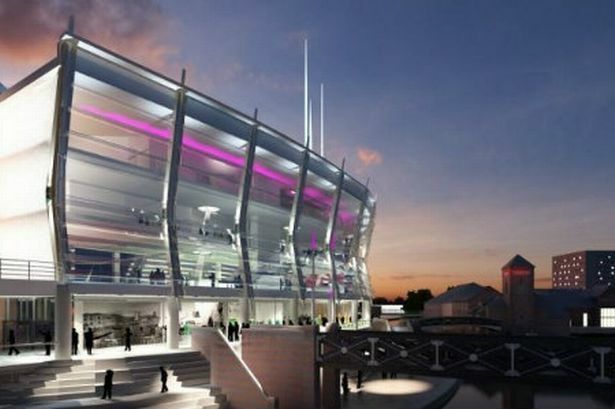 Mr Mead said the main arena bowl had served the NIA well and few changes will be made aside from adding extra leg room. He said: "The bowl itself is a neat design but one of the things our audience feedback showed is they would like more leg room. "We are replacing all the seats in the bowl and have managed to create extra room without major changes." Construction work, being carried out by Bam, will take 16 phases, taking in everything from the back-of-house, to toilets, to the the giant concourses. Three towering sky needles – to represent gold, silver and bronze – will also be added later, along with the giant glazed facade. The exterior will also feature a "wonderwall" – a giant wall of mood lights looking over the city. A key part of the refurbished NIA will be sharing in customers&apos; digital conversations. That includes technology to locate people and communicate through email and social media. Mr Mead said bringing in additional revenue was key to ensuring Birmingham City Council had a return on its loan. "We couldn&apos;t go to the city and say &apos;give us £20 million&apos; and then wait for it to come," he said. "We had to show good reasons and we were able to do it by coming up with the right business model to increase revenue, which we have borrowed against."